In a dramatic turn of events on Wednesday afternoon, Narmada Bachao Andolan (NBA) leader was "discharged” from Indore’s Bombay Hospital following a court order on the basis of a habeas corpus application, only to be "rearrested". On her way to Badwani, Patkar’s car was intercepted by nearly 35 police vehicles. 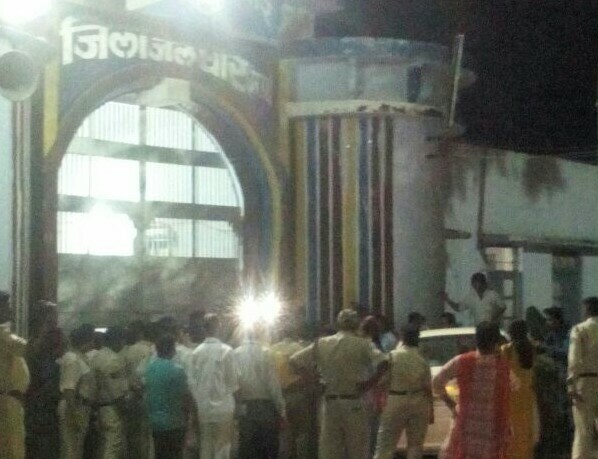 In her 14th day of indefinite fast, the car’s driver was forced out, and she was taken to Dhar jail. Meanwhile, NBA has released a list of 47 persons who were injured and are under treatment during the police lathicharge on August 7 in Chikhalda village, where Parkar is on indefinite hunger strike since July 27 for 40,000 oustee families of Narmada dam who have still not been rehabilitated. After picking up fasting Patkar from Chikhalda village on August 7, the Madhya Pradesh cops took her to Indore, even as taking nine those who were on hunger strike to Dhar. The injured people were admitted in Badwani. Earlier in Indore, two senior NBA activists trying to meet Patkar, Chinmay Mishra and Bilal Khan, were detained by the police but released after they were interrogated at two separate spots. An NBA communique said, the whole scenario shows that the Madhya Pradesh chief minister was "lying" about his concern for the health of Patkar. "The fasting people have been illegally detained and are not allowed access as normal patients", it added. In a related development, NBA has submitted a petition to the National Human Rights Commission (NHRC), asking it to take strict action against "violent attack" by police officials and others involved in lathicharging NBA activists in Chikhalda. NBA submitted a separate complaint to the UN Rapporteur on Housing about "forcible eviction" of thousands of Narmada dam oustees and effort to resettle them in poorly prepared resettlement sites. Meanwhile, protests took place at several placed in the country against "the high handed" action of the Madhya Pradesh police, belonging to two different districts, Dhar and Badwani, which led to the detention of Patkar and other testing NBA activists and injury to 47 others, some of whom have been admitted in ICU in Badwani. 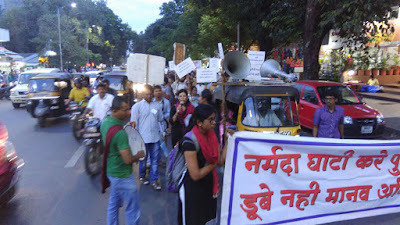 In Delhi, protestors marched to the Madhya Pradesh Bhavan and submitted memorandum demanding immediate release of all from the hospitals and allow them to discuss their next course of action. They also demanded action against the district magistrate, the superintendent of police and other officials "responsible" for the "high handedness" of the police, seeking dialogue with the NBA. 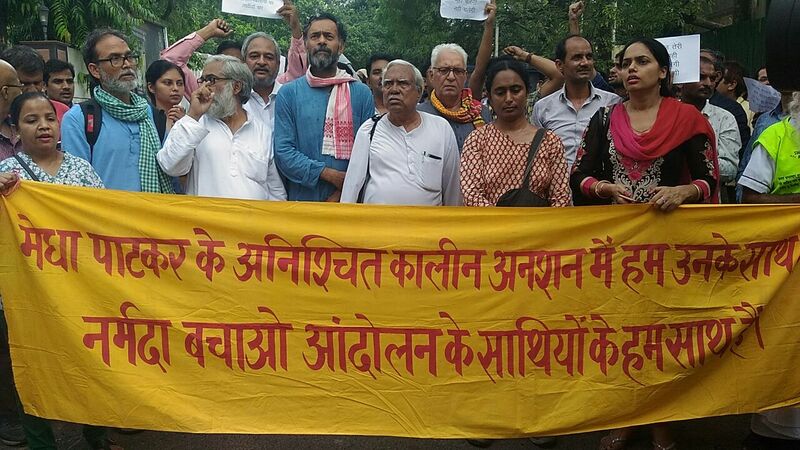 A delegation of Hannan Mollah (former CPM MP), Yogendra Yadav (Swaraj Abhiyaan), Kavita Krishnan (All-India Progressive Women's Association), among others, submitted a memorandum to the Deputy Resident Commissioner and Joint Resident Commissioner, signed by 30 representatives of people’s organization. 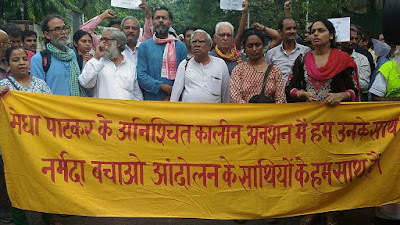 Those signed also included social activist Shabnam Hashmi, Rajendra Ravi of the National Alliance of People's Movement (NAPM), Gandhian intellectual Sandeep Pandey, Faisal Khan of the Khudai Khidmatgar, Bhupendra Singh Rawat of the Jan Sangharsh Vahini, and Ramesh Sharma of the Socialist Unity Centre. 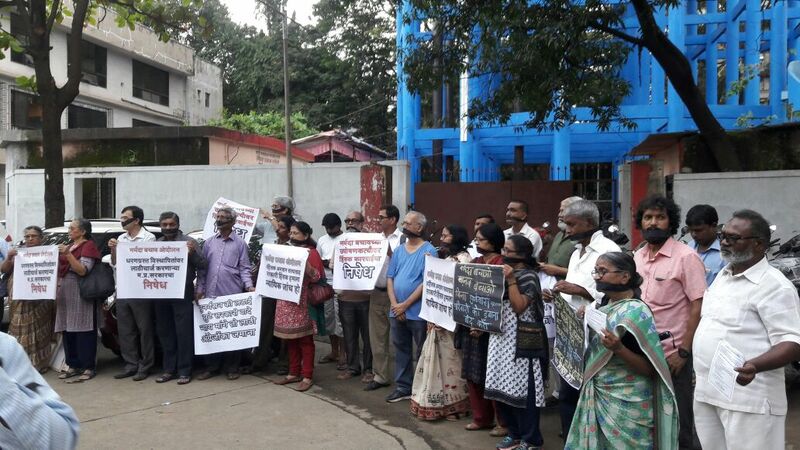 Madhuresh Kumar, national convener, NAPM, the apex body of tens of people's organizations, including NBA, and a Patkar associate, gave a brief account of the incident which led to the detention of Patkar and others. Kumar said, the government has used violent tactics, but "we will keep our fight on." 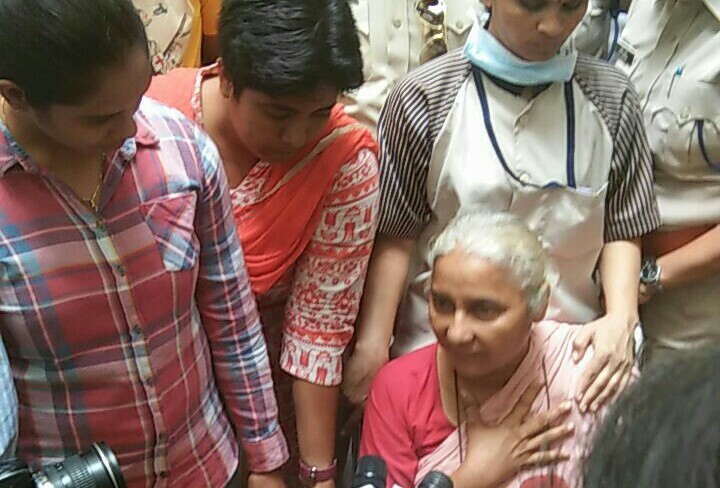 "Since August 7, Patkar and others have been admitted in Indore and Dhar hospitals, respectively, with limited access. The government has maintained that they are concerned about their health and they are only hospitalized. If they are hospitalized then shouldn’t they be treated like normal patients with visitation rights by their colleagues, friends and, family? ", he wondered. "The government claims that it is concerned about their health, which would have meant that all the 12 should have been kept in the same hospital. But this has not happened. Nine of them are n the Dhar district hospital and two, Rukmani Bahan and Bhagwati Bahan, have been left at the Chikhalda protest sit, where they continue to fast", he added. Yogendra Yadav said, "The protesters are asking very basic things, rehabilitation of all the affected people and on the issues. The Madhya Pradesh government is lying all over and using forces on peaceful protestors. The movement has exposed the development model and given the protesters courage to ask what development means for to people." Sandeep Pandey said that the government "is not acting for the benefit of the people, but just as the Gujarat government destroyed the Sabarmati River, the Madhya Pradesh and Central governments are doing the same with people of Narmada Valley." 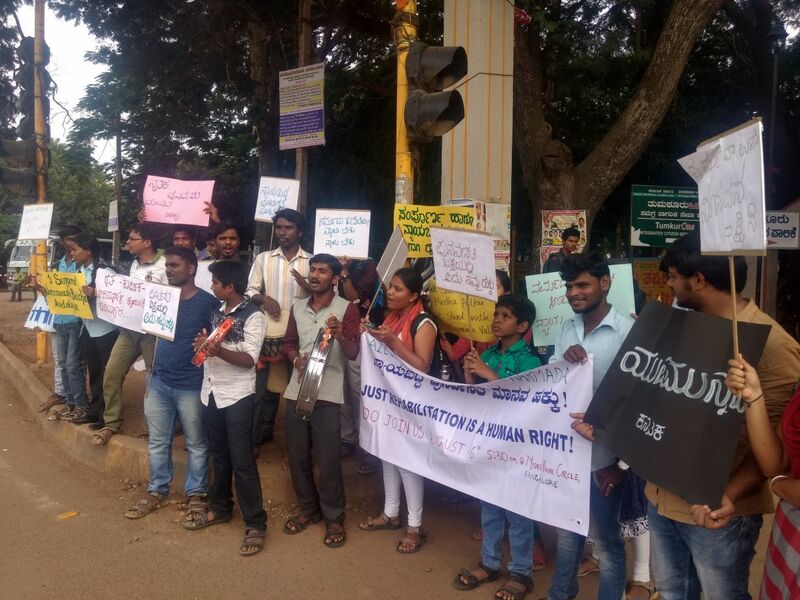 Protest actions also took place in Bengaluru and Tumkur (Karnataka), Bhopal, Hyderabad, Pune, Bhopal, Varanasi, and Bhubneshwar. In Chikhalda, the village where Patkar and others were on fast, students of Salsabeel Green School raised slogsns against the arrest of Patkar and others.